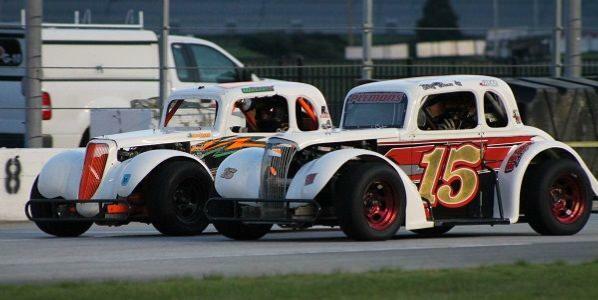 Drivers will descend on the "Thunder Ring" for a special edition of Championship Night on Saturday, August 4th at Atlanta Motor Speedway. Six different divisions will crown champions for the 2018 season of Thursday Thunder presented by Papa John's Pizza. The tightest race is in the Master's division between Robbie Woodall of McDonough and Bill Plemons Jr. of Locust Grove as the pair is separated by three points at the top of the standings. Woodall took the points lead with a victory in week 9, but a win by Plemons on Championship Night will give him the title. "The way the points work, it's all going to come down to the next race either way," said Woodall. "The last week is THE week." A victory by Plemons and a second place finish by Woodall on championship night would leave the pair deadlocked at the top of the points standings with an equal number of first and second place finishes - but in this scenario, the tie breaker and the title would go to the week 10 winner in Plemons. "It's been a great battle all year [with Robbie]," said Plemons. "We haven't had any troubles and haven't wrecked each other. We've been side by side and giving each other room. He's a great competitor." As long as Woodall can keep Plemons in his rear-view mirror when the checkered flag waives as he crosses the start-finish line, he'll earn his first ever Thursday Thunder Championship. The Associates Group Young Lions division didn't see any changes at the top of the leaderboard in week nine as Ryan Rackley of Valdosta found victory lane for the third time this season. "Getting the championship in the Thursday Thunder series is more important than getting the national championship points lead by far," said Rackely following his week nine victory. Rackely leads Social Circle's Lawson Ingold by four points and knows he needs to be consistent on Championship night to claim the title. "I just have to get out front and stay out there and be consistent," said Rackley. "If I get moved, I can't lose my composure and just work to get it back." Ingold battled Audrie Ruark of Suwanne in third for much of the night, but was able to keep pace with Rackley in the point standings as he finished second. Ingold used a late race caution to scoot by Austin Macdonald of Pictou, NS to move up a spot and finish behind Rackley. The VP Racing Fuels Pro division remains wide open heading into the championship finale. A 16 point swing saw Dawson Fletcher of Canton move ahead of Griffin's Cody Hall for the division lead. Hall held a commanding 11 point lead entering last week's action, but a sixth place finish and just one passing point didn't help his cause. Fletcher elected to start at the back of the field on the inside of row six and made up 9 positions to finish second and earn second place points and 9 passing points to inch ahead of Hall by five points for the lead. Passing points could play a huge role in determining the VP Racing Fuels Pro champion on Saturday night. Semi-Pro drivers are chasing Davis Rochester of Lebanon, TN for the title. Rochester won his third feature race of the season last week and holds a 21 point advantage on DJ Canipe of Fallson, NC. Kelly Puckett of McDonough has used wins in the first two weeks of the season to build a substantial margin in the Bandits division. He leads Ryan Younginer of Locust Grove by 27 points heading into championship night. Blaize Maddox of Locust Grove continues to dominate the GRT Racing Driver Development Outlaws division as he has found victory lane six times and hasn't finished lower than third all year. Despite his dominance on the podium this year, he only holds an 18 point advantage on Kenny Brady of Marietta for the division title. The 2018 season continues culminates with a special-edition Saturday Championship Night this weekend on Saturday, Aug. 4.